Generally speaking, EDM is perceived to purvey a very specific sound and experience, even if there seems to be no real logic to defining the term itself. While its occupied its space over the last several years, a handful of more retro-indebted dance-indie bands have continued to plug along, putting out albums that seem loaded with famous pop songs you’ve somehow never heard before. We used to have LCD Soundsystem; we still have Hot Chip, and we still have Cut Copy. In some alternate world in my head, Cut Copy’s the sort of band that has massive radio singles. Stuff like “Where I’m Going” or “Let Me Show You Love” is the type of music I always wish people played more at parties. There’s a whole host of factors that separate an artist like Cut Copy and an EDM festival headliner like Tiësto, but at least part of why there’s this type of dance music and that type of dance music, and why they occupy such different spheres of the music landscape today, has to come down to temperament. 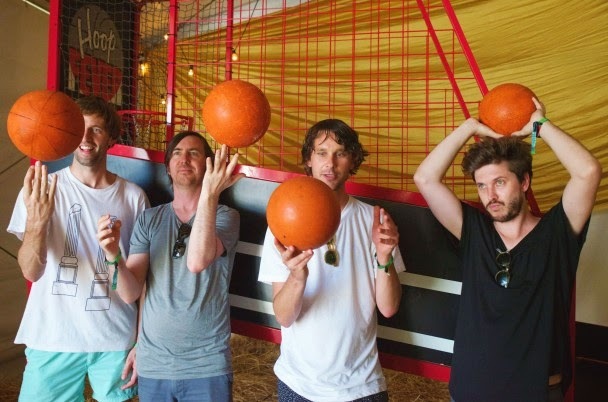 Last month at Bonnaroo, I had the chance to talk to Cut Copy for a bit. They’re unassuming, casual, exceedingly friendly guys. Compared to the persona- and production-driven spectacle of something like Ultra Music Fest, bands like Cut Copy have become almost workmanlike. When I spoke with them, they were in the midst of a busy summer tour schedule, after having taken a few months of a break after releasing Free Your Mind late last year. The idea of getting home and beginning work on another album was already in the air. STEREOGUM: Are you at the point yet where you've been thinking about a new record yet? MITCHELL SCOTT: I mean, it’ll be on the cards. It’s always like this thing that’s sort of waiting until you get to work on something new. We usually treat it as a separate stage rather than write little bits and pieces. Wait till we get home. STEREOGUM: How do you guys write these days? Does someone bring in a song and teach you the parts they want, or do you collaborate and jam a bit? DAN WHITFORD: It’s traditionally been: I’ll work on a song, bring it to the other guys, then we’ll work on it together. Then maybe with a producer or somebody else. It’ll sort of take shape, and then when it’s finished, hopefully it’s a good track. I guess that’s sort of been the way we work, but that’s not to say we wouldn’t change that at some point. It’s really pretty open depending on the situation. STEREOGUM: It seems a lot of people heard Madchester influences on Free Your Mind, a lot of late ’80s and early ’90s stuff. WHITFORD: For me, that’s music I listen to quite a lot. Originally getting into dance music — because I sort of started with guitar/bass sort of music — that offered a bit of an entry point to dance music. I probably got a little bit nostalgic for that era. It was kind of popping up in my subconscious as well. So I think in starting to make the record, one of the influences in the early stages was re-discovery of early dance music and acid house and a lot of the associated bands. And that Manchester scene was a part of that. But I think there’s a unifying value to dance music and then something interesting about that kind of shared experience, shared consciousness — you know, when you’re out at a club and you’ve been there for five hours or something, and you’re in the moment. STEREOGUM: When you guys start a new record, do you think in terms of “We want this one to be more X, Y, & Z,” or do you just start working on songs and see how they eventually cohere into an album? WHITFORD: I think we generally develop ideas when we’re on the road, we talk about stuff, we get into different music. We end up going to record stores and buying stuff. There’s lots of great record stores in the U.S. I think we have a few ideas when we start a new record, and then they sort of get felt out a bit, there are a few themes running. As we’re going, usually it becomes more clear of what it is we’re on about. Songs start to relate to each other. For this album, for me, when we were working on the song “Free Your Mind” — and there wasn’t a plan to call the album Free Your Mind at that point or anything, that was just another song amongst all of them. But we all felt like that song was a real cornerstone to everything else we recorded. STEREOGUM: Now that it’s been out there for a little while, how do you find that people are situating that amongst you other work? TIM HOEY: It’s been good. People have been coming to the shows. We’ve heard a lot from people when they hear these songs live. I think it kind of changes the view of the kind of songs they are. Because it’s very immediate and it’s very poppy. That was one of the ideas [going into the record], that it would be very uplifting. The songs live seem to be going down really well. I think one thing about Cut Copy is everybody has different records that they like, but it’s different every time. Reviews for the records are different every time, and people always pick out different things from the songs. It’s kind of tough — with the internet, everybody has their opinion. So it’s hard to grasp exactly how [people perceive] what we do. The only way you really know is at your shows. STEREOGUM: Is there anything you've picked up on the road this time around that is inspiring you? HOEY: I think so. I think we've seen some things recently that we've been talking over. Just seeing Panda Bear at Sasquatch! a couple weeks ago. He was predominantly playing new material and it just sounded fantastic. Everyone’s bought a whole bunch of records. SCOTT: It’s not even a literal thing where you think “I wanna do that.” We always take a stereo around with us to our band room, so we've always got tunes before we go on. It’s whatever we’re doing together, taking in new music and old music. STEREOGUM: Amongst the four records, do any of you feel like there’s a unifying core nature to Cut Copy’s music, like something that you’re always trying to seek when you start to write an album, or write a song? There often seems to be the sense of seeking transcendence on your records. SCOTT: I think when you work on tracks, you try to employ some elements of dance music and try to find something that is the best of both worlds. That we can bring some pop music and interesting tunes, and then employ some of those crazy crescendo moments of dance music. When things work well, there’s tension and release. I think that’s just using different elements, employing structures and conventions of dance music in pop music. It’s something we enjoy working with. STEREOGUM: What are your hopes for Cut Copy in the future? SCOTT: To keep making records … has always been something we’ve set out to do. We’ve never really tried to repeat ourselves. Every time we tour a record, when we’re working with labels and stuff, it always seems to take a long time to get music released. That’s how it is, but we’re always trying to get music out more often. We've always wanted to be a band that at some point can say we have a lot of records. Bands like the Fall. There’s a lot of the bands we admire have managed to release a million records. WHITFORD: It’s funny, when I first signed before forming the band, it was for a four album deal. There were certain points where it was hard to imagine how we would make four records. It just seemed like a huge amount of time to invest into making each record and tour. It’s cool now, at this point, to see we’ve got four records and our future can be whatever. STEREOGUM: Do you feel like, in some capacity, this is a new chapter for you, given that you signed that original deal and seen four records come to fruition? WHITFORD: Completely. It’s really liberating in a way. Not that it’s been the worst thing in the world, but it certainly feels like possibilities have opened up and at the end of that we can move on to whatever we want, really. We can reinvent ourselves. One of the really recently inspiring artists for me has been Caribou. He’s done so many different things, folky psychedelic stuff to futuristic dance music stuff. That new track — talk about tension and release. To me, that story with him and how he’s managed to do all these exciting, different things is really inspiring. I imagine that going forward, we want to be able to just do things, to be able to try and evolve what we do. So that we can look back on it and know we covered some pretty diverse territory.